Wider use of EHRs, along with computerized provider order entry (CPOE), clinical decision support (CDS) and barcode medication administration, could play critical roles in addressing the Joint Commission’s National Patient Safety Goals, according to a recent commentary in The Journal of the American Medical Association. In the interview below , one of the co-authors, Dr. Ryan P. Radecki discusses the commentary. The Joint Commission's 2011 National Patient Safety Goals (NPSG) include identifying patients correctly, getting test results to the right staff person at the right time, making sure medications are labeled correctly, checking medications for possible adverse reactions, preventing infections and identifying patients at risk of suicide. Incorporating the National Patient Safety Goals into the criteria for EHR certification would facilitate the use of EHRs to address patient safety issues. "The 2011 NPSGs provide high-yield guidance to EHR certification and oversight bodies who should refine their criteria for meaningful use to include incentives for development and use of tools to enhance safety. As with all computer-based interventions, incorporation of EHRs into routine clinical workflow is critical; their effectiveness depends on appropriate maintenance, effective user training, periodic institutional self-assessment of EHR safety and effectiveness, and clinically focused policies to support their use. Although EHRs by no means represent all necessary mechanisms to address critical safety problems, they can provide tools to help organizations improve their performance." More needs to be done to assure patients that their personal medical information will be safe and secure following the nationwide switch to Electronic Health Records (EHRs), according to results of a recent online survey conducted among 2,720 U.S. adults for Xerox Corporation (NYSE: XRX) by Harris Interactive. Nearly 80 percent of respondents who have concerns about digital medical records indicated stolen personal information by a computer hacker to be their number one worry, followed by the threat of lost, damaged or corrupted records at 64 percent and the misuse of information at 62 percent. And despite healthcare reform dominating the news for the last year, the survey indicates that respondents are still unclear on how EHRs impact them. Only 18 percent (up just 2 percent from Xerox’s 2010 survey) of U.S. adults who have a healthcare provider have been approached by their provider to discuss EHRs. Botsford Hospital in Farmington Hills, Mich., is launching its Electronic Medical Records (EMR) system at the end of this year. The system will allow EHRs to “follow” a patient as he or she moves through different departments of the hospital, enhancing the quality of care. “When a patient moves from the Emergency Center to Radiology or Critical Care, for example, their EHRs will be immediately available to the various caregivers, greatly increasing patient safety and quality of care,” said Dr. Paul E. LaCasse, president and CEO, Botsford Hospital. In addition, this year’s survey found that more than half of U.S. adults familiar with the conversion of paper records to digital records (51 percent) do believe that EHRs will result in better, more efficient care – up from last year’s survey when only 49 percent agreed. This survey was conducted online within the U.S. by Harris Interactive on behalf of Xerox Corporation from May 5 – 9, 2011 among 2,720 adults ages 18 and older. The survey in 2010 was conducted Feb. 17 – 19, 2010 among 2,180 adults ages 18 and older. This online survey is not based on a probability sample and, therefore, no estimate of theoretical sampling error can be calculated. For complete survey methodology, including weighting variables, please see below media contacts. Xerox Corporation is a $22 billion leading global enterprise for business process and document management. Through its broad portfolio of technology and services, Xerox provides the essential back-office support that clears the way for clients to focus on what they do best: their real business. Headquartered in Norwalk, Conn., Xerox provides leading-edge document technology, services, software and genuine Xerox supplies for graphic communication and office printing environments of any size. Through ACS, A Xerox Company, which Xerox acquired in February 2010, Xerox also offers extensive business process outsourcing and IT outsourcing services, including data processing, HR benefits management, finance support, and customer relationship management services for commercial and government organizations worldwide. The 134,000 people of Xerox serve clients in more than 160 countries. For investor information, visit http://www.xerox.com/investor. The President’s Council of Advisors on Science and Technology (PCAST) met on July 15, 2011. Outgoing Federal CIO Vivek Kundra updated the committee and gave insights into many of the challenges he sees ahead. "I think the privacy implications are very, very serious," Kundra said. "From a national security perspective what we've done is we've made sure that the NSC (National Security Council) is involved as we're vetting some of these critical data sets." The Committee on Oversight and Government Reform held a meeting on July 14, 2011 entitled "Transparency and Federal Management IT Systems." The hearing examined how federal agencies use their financial management IT systems, highlighted best practices, and looked at systems in need of improvement. Specifically, the hearing focused on the information technology systems federal agencies use to report spending, examined how these systems connect with government-wide systems, and looked at problems that lead to inaccurate, delayed, or incomplete reporting. Good afternoon, Chairman Lankford, Ranking Member Connolly, and members of the Subcommittee. Thank you for the opportunity to testify on ongoing efforts to improve transparency through information technology. Since day one, the Administration has been committed to open government and increased transparency. As President Obama stated in his Inaugural Address, we must “spend wisely, reform bad habits, and do our business in the light of day, because only then can we restore the vital trust between a people and their government.” Transparency strengthens our democracy and promotes efficiency and effectiveness in Government. Open Government platforms have helped the Federal government crack down on wasteful technology spending, attack fraud and abuse, and spur innovation by democratizing data. As we scale these practices we undoubtedly will face obstacles on many fronts. Yet, our efforts to date have revealed key principles that will guide us as we move forward. We launched the IT Dashboard and transformed the way we look at Federal IT investments. Information on the performance of IT projects – such as budgets and schedules – that was once stored within agency walls on reams of paper and seldom updated is now publicly available online and refreshed every month. Using the Dashboard, anyone from agency officials to the American people can now identify and monitor the performance of IT projects, on their laptops and mobile phones, just as easily as they can monitor the stock market or baseball scores. If a project is behind schedule or over budget, the Dashboard tells you that. The Dashboard ends the days of faceless accountability. It provides the name of the agency official responsible for the project, shows you their picture and lets you contact them directly to provide feedback on the project’s performance. The release of this information was a massive change in the way we had traditionally managed Federal IT. Vendors, project managers, and agency Chief Information Officers are now executing their projects in the light of day. For the Dashboard to drive transparency effectively, it had to be easy to use. We sought to build a consumer-class product that opened up the operations of the Federal Government to the world – not a compliance-oriented tool that would be seldom used outside the halls of government. So we focused relentlessly on the customer from the outset. During the 60 days we took to build it, we reviewed early versions of the IT Dashboard with members of Congress, GAO, industry, and various good government groups. Their feedback was instrumental in shaping the end-product. We also wanted to make the Dashboard as easy as possible for agencies to update. To help them learn to use the IT Dashboard and see in advance how their data would be reflected, we held a series of open houses with agency CIOs, capital planning leads, project managers, and other IT staff. These sessions not only enabled them to become familiar with the IT Dashboard prior to launch, but also allowed us to hear directly from them how we could improve the IT Dashboard and reduce their burden in reporting on the status of IT projects. We didn’t wait until the data was perfect to launch. In fact, had we waited for perfect data, the IT Dashboard would still be awaiting launch today. Only by exposing the data and holding agencies accountable will the data quality improve. GAO is a part of the effort, holding regular audits of IT projects reported to the Dashboard, to make sure the data is timely and accurate. And several members of Congress have sent letters to agency heads to underscore the importance of the data quality effort. In addition to capturing accurate data, we must capture meaningful data. The information sources for much of the Dashboard1 had become stand-alone processes to request and justify funding rather than serving as management tools for monitoring program health. Just last week, we took an important step in increasing transparency by redesigning the exhibits to be used in budget processes. This effort will increase the relevance of IT investment data, better align budget with management processes, improve data quality, and reduce the reporting burden on agencies. Going forward, we will continue to improve the Dashboard to provide even better insight into the performance of Federal IT investments. We continue to solicit and incorporate feedback from Federal agencies, Congress, and the American people. But simply shining a light and hoping results follow is not enough. We must also take action. That is why in January 2010, we held the first TechStat Accountability Session. A TechStat session is a face-to-face, evidence-based review of an IT program to turnaround, halt or terminate underperforming projects. TechStat sessions yield results. To date, they have led to over $3 billion in life-cycle cost reductions, and have reduced average time to delivery from over two years to eight months. We have scaled this capability across the Federal government, increasing the number of programs that can be reviewed and hastening the speed at which interventions occur. So far this year, we have trained 129 agency representatives to implement the TechStat model at their respective agencies and major agencies now conduct their own TechStat sessions. We have open-sourced the IT Dashboard code and the TechStat process, making them freely available for any organization to use of these tools. Already, 38 states and territories have expressed interest in using the platform for state government use, taking advantage of a proven system instead of building their own from scratch. From day one, the President identified transparency and accountability as essential to having government programs function effectively and efficiently in serving the American people. And the Recovery Act was implemented with these priorities top of mind. Throughout the life of the Recovery Act, the Administration has worked with Congress, the Recovery Accountability and Transparency Board, recipients and other stakeholders to ensure that the funds were spent with a minimal amount of waste, fraud, or abuse. Given the speed at which the funds were allocated, we knew there would be considerable challenges. Despite that, the Recovery Act has had an unprecedented low level of fraud, with less than 0.6% of all awards experiencing any waste, fraud, or abuse. The approach we took was to allow unprecedented visibility into how these funds were being spent. Recovery.gov to provide taxpayers with user-friendly tools to track Recovery funds – how and where they are spent – in the form of charts, graphs, and maps that provide national overviews down to specific zip codes. In doing so, we provided a powerful tool for an army of citizen inspectors general to help us root out waste, fraud and abuse. Because transparency was a fundamental component from the beginning, it deterred much fraud before it ever occurred. There were many challenges along the way, as we developed a new system for those receiving the funds to report how they were being used. Early on, we adopted uniform identifiers and data standards wherever feasible to ease the flow of data and reduce system complexity. Still we had instances where data entry difficulties led us to lessons learned to prevent such problems in the future. For example, early analysis of Recovery.gov showed that recipients were reporting money flowing to Congressional Districts that did not exist. To prevent this from happening again, the reporting system was modified to check for errors at the point of entry and collection. This prevented these bad data from entering the system in the first place. The Administration also has improved the type of data available on USASpending.gov. Beginning in October 2010, taxpayers have been able not only to track obligations by Federal agencies but also can track obligations made by those recipients to other entities (for example, tracking payments from a prime contractor to a sub-contractor). As of May 2011, USASpending.gov displays – for awards made beginning in 2000 – over $25.4 trillion in prime awards, based on over 47,000 individual prime awards, and more than $3.9 trillion total in sub-awards. Building on the lessons learned from the implementation of the Recovery Act, the President signed an Executive Order on June 13th establishing the Government Accountability and Transparency (GAT) Board. The GAT Board will provide strategic direction for enhancing the transparency of Federal spending and advance efforts to detect and remediate waste, fraud and abuse in government programs. The idea behind Data.gov was simple: to release as much government data in its raw, machine-readable format to the web, without compromising national security or individual privacy, and to spur public development of new data-driven, innovative business ideas. On May 21, 2009 after six weeks of development, Data.gov launched, enabling the public to easily find, access, understand, and use data generated by the Federal government. Rather than creating a huge, complex system, which would have taken years, we took the approach of a lean start-up and launched a minimum viable product with just 47 datasets. Today, there are more than 390,000 datasets available. Beyond that, Data.gov has democratized data and tapped the ingenuity of the public, inspiring scores of citizen-created applications that turn raw data into services to help the American people. Just as the Defense Department’s release of GPS data created a new industry, Data.gov has unleashed an “app economy” with over 300 high-value tools and apps developed to date. Innovators from across the country have been busy putting these datasets to work because the data is accessible, useable, machine-readable, from authoritative sources, in an open platform, and incorporates user feedback. Citizen-created apps now help parents keep their children safe, assisting travelers find the fastest route to their destinations, and informing home buyers about the safety of their new neighborhood. Data.gov is at the vanguard of a global movement. 29 U.S. states, 11 U.S. cities, one tribe, and 19 countries have followed in Data.gov’s footsteps in implementing open data platforms. Moving forward, we must expand our efforts to shine light on the entire $3.7 trillion in the Federal Budget2, including entitlements, insurance, loans, operational costs, payroll, and tax expenditures. Tackling this challenge will force us to confront obstacles on many fronts. For example, on the technical front, there are currently more than 12,000 systems, composed of hundreds of thousands of subsystems and countless databases. The way we fund IT, agency-by-agency, bureau-by-bureau, creates additional obstacles, leads to duplication, and hinders our ability to share services government-wide. This has resulted in a multitude of separate Federal data collection and display websites. Leveraging the lessons learned from the Administration’s transparency efforts, we have distilled the following key principles to guide us as we shine light on the $3.7 trillion in all Federal spending. 1. Build end-to-end digital processes – Automate transfer of data between systems to increase productivity, protect data integrity, and speed data dissemination. Capitalize on game-changing technologies to increase transparency. 2. Build once, use often – Architect systems for reuse and share platforms to reduce costs, streamline systems and processes, reduce errors, and foster collaboration. 3. Tap into golden sources of data – Pull data directly from authoritative sources to improve data quality, shorten processes and protect data integrity. 4. Release machine-readable data and encourage 3rd party applications – Make data machine-readable to allow the public to easily analyze, visualize and use government information. 5. Use common data standards – Develop and use uniform, unique identifiers and data standards to ease the flow of data and reduce system complexity. 6. Validate data up front – Correct errors during collection and at the point of entry to block bad data from ever entering the system. 7. Release data in real time and preserve for future use – Release data as quickly as feasible to enhance its relevance and utility while maintaining future accessibility. 8. Reduce burden – Collect data once and use it repeatedly. Pull from existing data sets to reduce costs and burden and to increase productivity and uniformity. 9. Protect privacy and security – Safeguard the release of information to increase public trust, participation, preserve privacy, and protect national security. Open Government doesn’t mean vulnerable government. value, meaningful data sets, set priorities, to continuously drive and improve future planning and processes. As I reflect on the last two and a half years, the benefits of an open and transparent government are now clearer than ever before. We have saved $3 billion by shining light on Federal IT spending so far. We have seen an unprecedented low fraud rate in the implementation of the Recovery Act by taking a transparent approach from the outset. We sparked a new “app economy” by releasing government data through Data.gov. This Committee has long recognized the importance of an open and transparent government and I appreciate its ongoing support of our efforts and its help in securing funding for the government’s transparency efforts. Going forward, it will take all of us – Congress, Executive branch agencies, and recipients of Federal funds – working together to ensure accuracy and transparency of government data. Thank you again for your interest and I am happy to answer your questions. The eHealth Initiative (eHI) annual survey of health information exchange (HIE) "2011 Report on Health Information Exchange: The Changing Landscape," released July 14, 2011, documents the growing pains 255 HIE initiatives are experiencing today as they grapple with competing timelines to meet federal requirements, complex systems integration and the uncertain future of Accountable Care Organizations (ACOs). Despite privacy concerns that patients have over the safety and security of their personal information, the survey demonstrates an unprecedented amount of patient health information exchanged between physician offices, laboratories and hospitals. “Some exchanges have solved their technical issues and are offering more advanced services, such as analytics, quality reporting, wellness programs and education to providers and hospitals. As a result, they are in a much stronger position than those that have not expanded services,” said Jennifer Covich Bordenick, Chief Executive Officer. “HIE initiatives that cannot adapt quickly may not last long in a transformed healthcare system. The HIE marketplace is very competitive today, but the momentum seems to be with private sector HIEs,” added Covich Bordenick. There has been net growth of 9% in the number of initiatives, which total 255 in 2011. At least 10 HIE initiatives have closed or consolidated, and 46 new initiatives responded to the survey. Twenty-four initiatives report that they have sustainable business models, up from 18 in 2010. Initiatives are developing complex privacy controls for patients, even in the absence of new federal requirements. An increased number of behavioral or mental health providers report providing and viewing more data through exchanges. Despite uncertainty about accountable care organizations (ACOs), a quarter of the respondents indicated that they will support an ACO. In addition to struggling with business models and value, groups are facing new challenges related to technical aspects and systems integration. 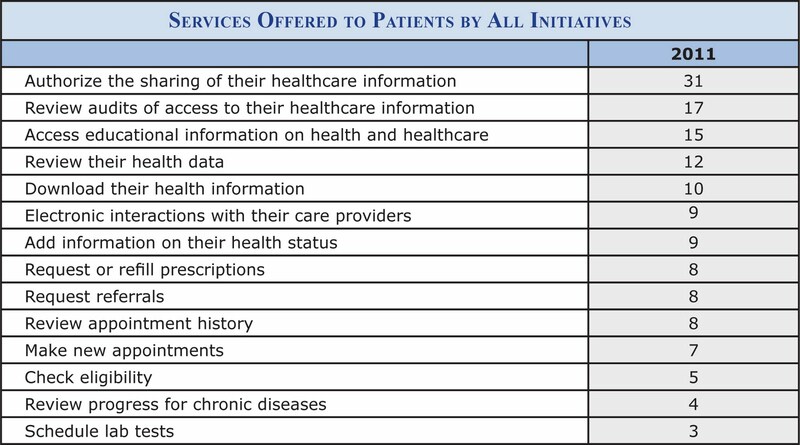 A majority of initiatives (113) plan to incorporate the federal Nationwide Health Information Network’s (NwHIN) Direct Project into their service offerings. 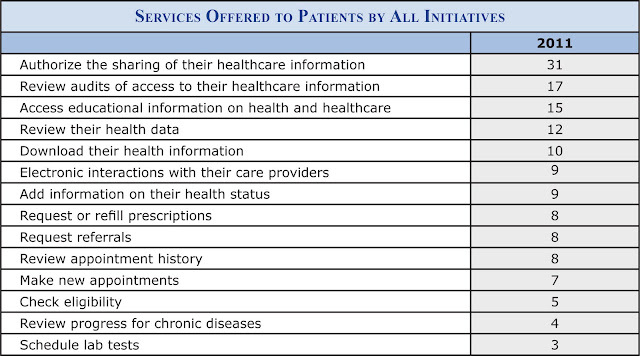 The majority of advanced initiatives (85) are offering at least one service that supports Meaningful Use requirements. HIEs must move quickly to help providers with meaningful use, Medicare Shared Savings Program rules and privacy recommendations. Hesitancy about moving forward until changes to the healthcare system are complete will only diminish growth. Privacy will continue to be an important issue for patients. If patients are to be engaged in their care, they have to trust that their information can be securely exchanged. One way of many to build this trust framework: initiatives can offer patients more than a global consent model. Groups need to “work with what they have.” Since initiatives need to rapidly innovate and move through the stages of development quickly, they need to consider working with the existing infrastructure in their geography. Where there are well-developed IDNs or health systems, the community-based or state initiatives should try to work with them. While competition can be good for innovation, in the current rapidly changing healthcare market, competition may not be the best option for sustainability. Health Information Exchanges (HIE) enable hospitals, physicians, and clinicians to improve the quality and efficiency of the care a medical community is able to provide to its patients through the electronic sharing of patient records. Thanks in part to Meaningful Use and other elements of healthcare reform in the United States, HIEs are now being formed, whether through a government-backed initiative or as private ventures. In last year's HIE performance study, KLAS found that, although the market was full of vendors offering an HIE solution, only a few HIEs were actually up and running. The new KLAS report, "Health Information Exchanges: Rapid Growth in an Evolving Market," looks more deeply into the adoption level of HIEs, as well as the state of each vendor's HIE activity, and how well that vendor is responding to provider needs. THE MARKET IS STILL A MILE WIDE, BUT SLOWLY GETTING DEEPER. The HIE market still has a wide array of vendors, and the total number of HIEs that KLAS has validated as live and exchanging data has more than doubled from 2009 to 2010. Several hundred other HIEs are in some stage of development. THE CREAM IS SLOWLY RISING TO THE TOP AMONG VENDORS. Determining which are the most viable players among the myriad of HIE vendors is becoming easier as some vendors continue to bring new HIEs live, while others are seeing little growth. 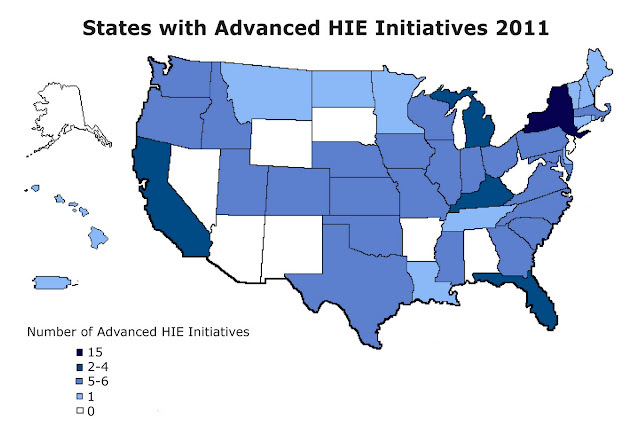 THE BULK OF HIE MARKET GROWTH IS IN PRIVATE HIES. While the number of live public HIEs KLAS was able to validate increased from 37 last year to 67 this year, the number of live private HIEs KLAS validated exploded from 52 to 160. MOST PHYSICIANS STILL HAVE TO LEAVE THEIR WORKFLOW. Although physician adoption was cited most often as a key indicator of HIE success, most HIEs still have work to do in making the system physician friendly. Among the live HIEs that KLAS validated, only 43% were delivering patient data directly into physicians’ EMRs. FUTURE FUNDING IS STILL A MAJOR CONCERN IN PUBLIC HIES. Of public HIEs interviewed, 54% expressed concern about future funding. Only 35% of private HIEs had the same worry. "The HIE market continues to mature since last year's report, and a number of vendors are beginning to stand out from the crowd," said Mark Allphin, author of the report. "But, most HIEs still have a long way to go before they will be able to start making the positive impact on healthcare that providers and regulators are hoping for. Interestingly, the number of live private HIEs has increased more rapidly than the number of live public HIEs." Public vs Private HIEs--why is one gaining more traction than the other? 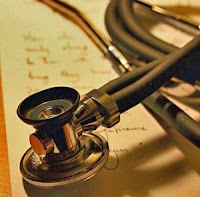 1) Governance - between the complications inherent in government-sponsored initiatives and the difficulty of getting competing healthcare organizations to agree on what to share, public HIEs have had a hard time earning physician acceptance, whereas private HIEs need not depend on public funds and/or government oversight. 2) Funding - at this time there are numerous grants and funding options available, but providers are very concerned that given normal economic and political upheavals monies may dry up at any time, leaving them without the means to continue functioning. One director at a public HIE commented, "The fact that our funding is dependent on political support in difficult economic times is worrisome. . . With new faces in the federal and state legislatures, there are no guarantees." Private HIEs, however, are typically funded by the stakeholders themselves, so future funds are less of a worry. According to respondents, physicians may be contributing to the lag in deployment of public HIEs. Providers reported that doctors are interested in HIEs, but not if they cause them to lose time searching for or wading through too much patient information. Concerns over data integrity and having outside providers push data into physician's EMRs were also voiced as contributing to the low adoption of public HIEs in the United States. One provider related, "The doctors were interested in this to start out, but once they realized that they were going to have to do things in two different places, they lost interest. It is just too cumbersome." With that challenge in mind, more HIEs are striving for ways to deliver useful data to physicians without requiring them to leave their normal workflow, but so far progress has been slow. More than 230 HIE customers were interviewed for this study. Together they evaluated a total of 35 HIE vendors. In the case of private HIEs, Medicity, RelayHealth, and Cerner ranked highest in performance scores. Although Epic Care Everywhere scored higher than all three, Epic was not ranked in this report because nearly all of the Epic exchanges KLAS was able to validate were between Epic hospitals. One Epic HIE was with a non-Epic EMR system. In the case of public HIEs, both Axolotl and Orion scored 83.8 and 85.5, respectively. However, neither solution was ranked in the report because they did not meet the minimum KLAS Konfidence levels. "While HIEs have made substantial progress over the last 12 months, the market is clearly still in the early stages," added Allphin. "The majority of HIEs are building the foundation for what they hope will become robust and meaningful exchange models. Meaningful Use will continue to put pressure on providers to make patient information accessible across the continuum of care, and with the rapid evolution of healthcare in the United States. HIEs will only increase in importance going forward." For more information about the health information exchange market, as well as the strengths and weaknesses of measured vendors, "Health Information Exchanges: Rapid Growth in an Evolving Market" is available to healthcare providers online for a significant discount off the standard retail price. In the first national study to examine care at critical access hospitals (CAHs) in rural areas of the U.S., Harvard School of Public Health (HSPH) researchers found that CAHs have fewer clinical capabilities, lower quality of care, and worse patient outcomes compared with other hospitals. The researchers found that patients admitted to a CAH for heart attack, congestive heart failure, or pneumonia were at greater risk of dying within 30 days than those at other hospitals. The study shows that despite more than a decade of policy efforts to improve rural health care, substantial challenges remain. In an analysis of data from more than 4,500 hospitals that serve Medicare beneficiaries, critical access hospitals (CAHs; no more than 25 acute care beds, located more than 35 miles from the nearest hospital) had fewer clinical capabilities, worse measured processes of care and higher rates of death for patients with heart attack, congestive heart failure or pneumonia, compared to non-CAHs, according to a study in the July 6 issue of JAMA. "Critical access hospitals play an important and unique role in the U.S. health care system, caring for individuals who live in rural areas and who might otherwise have no accessible inpatient care," according to background information in the article. "The CAH designation was created with the goal of ensuring 'proximate access' to basic inpatient and emergency care close to home for approximately 20 percent of the U.S. population that still lives in rural communities. Despite broad policy interest in helping CAHs provide access to inpatient, care, little is known about the quality of care they provide. "Despite more than a decade of concerted policy efforts to improve rural health care, our findings suggest that substantial challenges remain. Although CAHs provide much-needed access to care for many of the nation's rural citizens, we found that these hospitals, with their fewer clinical and technological resources, less often provided care consistent with standard quality metrics and generally had worse outcomes than non-CAHs," the authors write. "… these findings should be seen as a call to focus on helping these hospitals improve the quality of care they provide so that all individuals in the United States have access to high-quality inpatient care regardless of where they live. "Critical access hospitals face a unique set of obstacles to providing high quality care, and our findings suggest that their needs are not being met by current health policy efforts," said Karen Joynt, a research fellow in HSPH's Department of Health Policy and Management and the lead author of the paper. The government defines CAHs as geographically isolated facilities with no more than 25 acute care beds. More than a quarter of acute care hospitals in the United States have been designated CAHs by the Medicare Rural Hospital Flexibility Program of the 1997 Balanced Budget Act. The program created payment reform that has kept small rural hospitals financially solvent, preserving access to care for rural Americans who might otherwise have no accessible inpatient provider. Joynt and her colleagues analyzed the records of 2,351,701 Medicare fee-for-service beneficiaries at 4,738 hospitals (26.8 percent of which were CAHs) diagnosed with acute myocardial infarction (heart attack), congestive heart failure, and pneumonia in 2008-2009. Compared with other hospitals, CAHs were less likely to have intensive care facilities, advanced cardiac care capabilities, or even basic electronic health records. These hospitals were less likely to provide appropriate evidence-based care, as measured by the Hospital Quality Alliance metrics. Patients admitted to CAHs had 30 to 70 percent higher odds of dying within 30 days after being admitted for heart attack, congestive heart failure or pneumonia. "We were surprised at the magnitude of these findings," said Ashish Jha, senior author on the study and an associate professor in HSPH's Department of Health Policy and Management. "These findings suggest that we need to redouble our efforts to help these hospitals improve." "To improve the quality of care patients receive at CAHs, policy makers could explore partnerships with larger hospitals, increasing use of telemedicine, or inclusion of these hospitals in national quality improvement efforts," said Joynt. "Helping these hospitals improve is essential to ensuring that all Americans receive high-quality care, regardless of where they live." Study authors included Yael Harris, director of the Office of Health IT & Quality at the U.S. Department of Health and Human Services and E. John Orav, associate professor in the Department of Biostatistics at HSPH. "Quality of Care and Patient Outcomes in Critical Access Rural Hospitals," Karen E. Joynt, Yael Harris, E. John Orav, Ashish K. Jha, Journal of the American Medical Association, July 6, 2011.